I use semi synthetic 10w/40 that meets API service SE, SF, SG type or higher, changed every 6000 miles. I had quick look at the wiring but will take a better look and take the switch out and test it, at the next oil change. Light didn't come on today. 'Should' be okay, it's been known before to get a build up of sludge with oil that's a bit past its time causing the light to either come on or flicker, but you're doing things right, it was just a thought that was all. Always best to change oil when it's warm to help avoid this scenario though. I must admit to having a bit of a laugh with you, and copied the spec verbatim out of the handbook. I thought you were going to say about using bike specific or even fully syn in the Fazer. We all know oil debates can run to several pages on forums. I used to use Comma car oil semi syn 10W40 in all my bikes. exceeds the spec given in the handbook. I also used to do work on other peoples bikes, who (being unenlightened or loaded) wanted JASO MA2 oil, I don't have time to do extra work now, with family and work commitments, so having a couple of barrels left over from that, it's what I use in the Fazer. When it's gone, it'll be back to Comma. My ZRX1100 is tuned to the bollox and has run all it's life on Comma car oil. Puts out over 160 BHP at the rear wheel. Not entirely sure where this post is going to be honest? If you're that clued up then i'd have thought you'd have at least known how to check your oil level properly? And when questions are answered on here you have to remember there are loads of other people reading it now, or years ahead in the future, because they may have a similar problem as you're having, which is why the responses are better off being clear and detailed. As for your heavily tuned up ZRX1100, do you not think it could possibly be a tad more tuned up if you did use motorbike oil in it? Just a thought! I used car oil in one of my previous bikes and it simply didn't like it and made it difficult to change gear, but once i replaced it a few days later everything was back to normal, so for me it's a case of "once bitten" and all that, rather than going by what other people say. It's the difference between knowing what is written in the handbook, and WHY it is written that way in the handbook. My oil's fine, checked the way I did. BTW light came on again today. Take the bulb out - problem solved. It might not be buggered it might just need to be cleaned. The float could be sticking or the wire going to the switch or a pin in a connector could be grounding. Thanks mate, exactly the kind of answer I was hoping for. Will check out at next oil change, which will be in about three weeks, as long as the snow holds off..
My Fazer has now clocked 97000 and I've ridden it with the 'oil light on' many times..... it's just a level switch.... as long as the oil pump is picking up oil, you'll be fine. The Fazer engine is pretty much unburstable... it's everything else that ultimately wears out.... not least the rider. Just to add to that in case any one finds this doing a search. The float has a magnet in it. 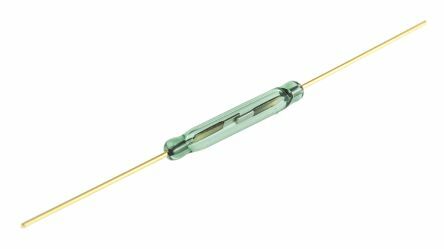 The shaft that the float moves up and down on has a reed switch in it like in the picture. When the float drops the magnet pulls the reed switch closed and that creates the path to ground for the oil light. Interesting - the reed switch, I have seen them snap in alarm systems from constant use (entry door) but wouldn't of mattered as in the bike it is normally open with full oil. Yeah normally open so the reed switch does nothing until the float drops so the reed switch is unlikely to fail due to wear. The one I looked at, the reed switch was working fine but the small circuit board that the reed switch is soldered onto was corroded due to water ingress and the track in the circuit board was completely gone so the circuit was always open even when the reed switch was closed. You'd never know that the circuit had failed open unless you checked if the oil light had come on during an oil change. The check that happens when you press the starter switch just shows that the bulb is working not that the oil level switch is working because when you press the starter switch it grounds the bulb through the starting cut off relay not through the oil level switch. I bet there are loads of corroded oil level switches but it goes unnoticed.